It’s the last day – and the last post – of the month, so it’s time for me to share my latest “grab bag” of useful links (see previous editions here). But before I do, I want to thank everyone who gave me such kind feedback on my last few posts related to the subject of hobbies. I loved all of the wonderful suggestions I received for new interests, as well as the compassion you extended to me regarding my challenges of late. In addition, I was very pleased that so many of you liked the photographs I shared in my last post. It meant a lot to me that some of you complimented my eye for composition. I feel like I’m on the right track with my new hobby and I’m sure my photos will only improve with time. A few of you mentioned that you’d like me to share more of my photos in future posts, so I plan to do that periodically. In fact, I took the photo below just yesterday at the La Jolla Cove! It was a beautiful day here in San Diego, so it was nice to spend a bit of time at the beach capturing the landscape for my sick friend and all of you. Included below are links to articles I think you’ll enjoy on the subjects of shopping and shopping psychology, wardrobe management, style, and personal development. I’m also sharing a few early “Recovering Shopaholic” posts that you may have missed the first time around (or may choose to revisit now). “Who Made Your Clothes? A ‘Slow Fashion’ Revolution Rises” – The rise of “fast fashion” has led to myriad human rights violations in garment factories, as well as unregulated pollution of the environment. This article on Fortune.com shares some of the ways activists and responsible brands are working to turn things around, including the recently created Fashion Revolution Day. “Shopping Addiction Symptoms, Causes and Effects” – If you’ve ever wanted to read a concise overview of shopping addiction, this guide from PsychGuides.com fits the bill. It covers the different types of compulsive shopping, common signs to watch out for, how to tell if you or someone you love is a shopaholic, and more. Although this guide is sponsored by an addiction recovery center, I feel the information is unbiased and covers key points on the topic of compulsive shopping. “Common Mistakes Women Make When Shopping” – Shopping can be fun and enjoyable, but it can also be overwhelming and confusing, even for seasoned shoppers. This article from My Year Without Clothes Shopping highlights the three most common mistakes that women make when they shop. Mistake number two is something that I wrote about very recently, having shopping as one’s only or default hobby. “How to Make Your Closet More Sustainable Without Buying a Thing” – Many of us care deeply about the environment and want to transport that caring over into our closets. Yet we don’t want to have to buy a whole new wardrobe (which would be pretty counterproductive anyway…). 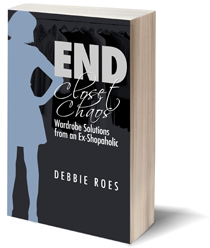 This excellent post from Grechen’s Closet outlines four simple steps that we can all take to cut down on wardrobe waste. “Is it Useful? Does it Bring You Joy?” – Not long ago, I wrote two posts about using Marie Kondo’s method from “The Life-Changing Magic of Tidying Up” to downsize my book and compact disc collections. Although I haven’t applied the KonMari process to my closet (yet… I still might), that’s actually where Kondo recommends we start our de-cluttering. But is “does this spark joy?” the right question for analyzing all of our possessions? Sally from Already Pretty explores that topic and recommends that we add a second question to the equation. “How to Create a Casual Wardrobe Capsule Outfit by Outfit” – Capsule wardrobes have been a hot topic in recent years, and my favorite stylist Bridgette Raes decided to address this subject in a recent post. I loved this post because it delved into putting together a casual capsule wardrobe – and it includes lots of photos. The way Bridgette breaks everything down makes perfect sense, as usual. In addition to the ensemble photos she usually posts, she also included a lovely photo of one of her own recent casual outfits. “10 Ways Personality is More Important than Body Shape When Choosing Flattering Clothes” –Many magazine and blog articles focus on the importance of dressing for our body shape – and that’s definitely an important factor to consider. However, personality can often be an even more important facet of how to dress in a flattering manner. Read what Imogen Lamport of Inside Out Style has to say on this topic. “Why I Don’t Believe in Dressing for My Body Type” – Anuschka Rees not only believes that body type shouldn’t be the most important factor in getting dressed, she doesn’t really think it’s significant at all. Check out what Anuschka has to say about wearing what we like, figure flattery be damned. “Helpful Necklace Guide” – I don’t know about you, but I tend to wear necklaces far more often during the spring and summer months. And I can tend to get confused about the best necklace to wear with any given ensemble. This simple guide from Tall Snob can help steer us all in the right direction. Of course, we can also opt to follow Anuschka’s recommendation above and just wear whatever makes us happy! 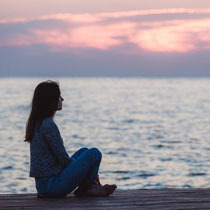 “How to Stop Checking Your Phone Like an Addict” – This article starts out with the almost unbelievable story of a woman who walked right off a pier in Australia because she was staring at her smart phone. I’m not to that level yet, but I have become a bit too addicted to checking my phone. This article from Medium highlights some recent research on the negative effects of mobile phones and presents two solutions for having a more balanced relationship with our devices. “How Marie Kondo Changed My De-cluttering” – My two posts on using the “KonMari Process” to downsize my possessions (see here and here) were very popular with readers. There will be more posts on that topic, but for now I thought you might be interested in reading about how another blogger de-cluttered using Kondo’s tips. This post from The 3rd Chapter covers clothing, shoes, bags, books, and papers and includes lots of photos. Each month, I share a few early “Recovering Shopaholic” posts (you can see all of them on the Archives page) that I think you might enjoy reading. If you resonate with these posts, I’d love to get your thoughts. I wish I could leave comments open on all posts, but I’ve had to close things out after two weeks because spammers really like to ruin our fun. Please feel free to share any comments you have about the archived posts here. “The Serial Return Phenomenon” – Do you have a tendency to return a large number of the clothes, shoes, and accessories you buy? At the time when I wrote this post two years ago, I estimated that I returned at least half of my acquisitions, and it wasn’t just because they didn’t fit well or strike my fancy. I frequently made returns so that I could shop more. If you identify with my experience, you may want to check out this early post. “Challenge: Shopping with a Friend” – Shopping is often a social activity that women do with their friends and family members. However, we frequently end up buying things we don’t really want or need when faced with peer pressure and the opinions of others. In this March 2013 entry, I share about a recent shopping trip with a friend and suggest a few ways to mitigate any potential damage of this common activity. “The Ups and Downs of Uniform Dressing” – Sometimes having a type of formula for getting dressed can help us get out the door more quickly in the mornings and streamline our shopping process. However, there are some downsides to dressing according to a uniform. In this June 2013 post, I outline the pros and cons of uniform dressing and show a celebrity uniform example, as well as three of my own. I’ll be back soon with my April accountability post and an update on my “Love It, Wear It” Challenge (LIWI – see previous posts here). If you have questions for me or suggestions for future posts, please share them in the comments section or contact me directly via email or social media. Have a wonderful weekend! Thanks for the links – these will be fun to browse over our UK bank holiday weekend. I’d already read the Bridgette Raes – and was very pleased to see it, as this is roughly what I’ve been doing over the past year, i.e. building up seasonal capsules outfit by outfit (not in advance, like project 333). Lately I had added a ‘rule of two’, i.e. that each key item had to work with at least two others. She has put the two together in such a simple and clever way! I hope you enjoyed the links this past weekend, Alice. I love your “rule of two” and think it’s a good guideline to have in order to avoid closet orphans. I also like the idea of building seasonal capsules as you go. Some people have even done that with Project 333 and it has worked well for them. Less stress overall… We can learn a lot just by paying attention to what we actually feel “called” to wear, like I’m doing with my LIWI Challenge. Superb photo of La Jolla. Looking forward to seeing your work replacing the stock photos. Your photography adds much warm and sincerity that compliments your honesty and candid style of writing. Nice work Debbie. Thank you, Terra! I would like to replace more of the stock photos with my own images, but I don’t feel excited to photograph clothing , at least not my own. Perhaps I can take some photos at a local store or boutique and see how that works out. Good idea to take photos around town at shops, or perhaps an object, along with city or street shots to accompany the story. You have a great eye for composition, structure and arrangement. Also a great way to add diversity, and to claim your place within the S.D. local category. Opportunity to gain wide local appeal, as well as the large national and international readership you have already established. Very good points, Terra. I will keep an eye out for places to photograph in my area. It could be fun. Thank you for another great post of useful links! I need some new blogs to read as I am missing Unfancy 😦 Love your photos! Great hobby and I hope you will continue posting the awesome shots! I miss Unfancy, too, Bella. I was surprised she decided to take a hiatus (which could end up being permanent), as I was looking forward to seeing how she would dress for Seattle weather. I’m glad you like my photos and I will definitely share more of them in the future. Hi Debbie, Your new hobby is inspiring me to also do more photography. The photo of La Jolla beach is wonderful – especially since it so much reminds me of the Sydney Harbour beaches in late spring-early summer. The scenery is very similar. Please keep the photos coming, especially the cat ones (I adore cats) as well as the San Diego beach scenes – we are heading into Winter in Sydney and these will remind me that after winter will come spring and summer. Thanks for a the new links. Great photo! You’re welcome, Jan, and glad you like the photo. I want to add a few words about two articles which I believe are related — the ones on shopping addiction and serial returns. While going into debt may be ONE symptom of shopping addiction, many who people over-shop/over-spend do so without going into “debt.” They can “afford” to over-spend. But can they really? Many folks who can “afford” to over-shop may be mortgaging their futures by not fully funding their 401(K) plans or setting up an IRA. Or they may be unable to save money for a down payment on house and end up renting for many years. Or they live with their parents even though they have a good-paying job. Or maybe they can’t afford to buy a car and end up leasing because the monthly fee is less than a car payment (depending, of course, on make and model, etc.). Or people spend money on clothes rather than invest in further education, which might result in a higher paying job or workplace advancement. Or they can’t pay down student debt at a faster rate and may be saddled with student loans for decades. Or they put off car or home repairs, dental work, vacations, charitable donations, and so on. Spending money, even money you think you can afford, on excessive shopping rather than investing in your future (education, housing, retirement) can negatively impact your ability to increase your net worth over your lifetime (AKA, wealth building) and can seriously impact the amount of funds available to you when you are 70, 80, or 90. Yes, it seems odd to talk about the angora sweater in your on-line shopping cart or the designer handbag you’re buying at the store as having a negative impact on the quality of life 30-40 years from now, but it can. I know people who spent a lifetime chasing down the perfect designer shoes and so forth and now face a much reduced lifestyle, even after working in a well-paying career. And I know a few people who lost their homes and relationships because of excessive shopping. Also, there is the skewed economics of buying something on sale, 25% off, and then taking a year or more to pay off at 18% interest (or higher). The value of the “sale” works best if you pay with cash or pay off the charge immediately. One other point about over-spending on clothes: Think about what impact the money you over-spend (beyond immediate NEEDS, not spending on “wants”) might have on your local community if you “invested” your money in community organizations. Giving $500 a month (wow!) to a literacy program for youth or the shelter for homeless people or disaster relief could be a game changer for you and the organization. The $500 spent monthly that might have been spent on glittery tees or clothes that will self-destruct in a month or two would add up to $6,000 p.a. For many organizations, a donation of $5,000 or more is a “major gift.” And the $6,000 is probably tax-deductible! Finally, a lot of people buy stuff they don’t need (for the rush, perhaps) and then return a lot of it — mostly because they realize they don’t need it. But many also buy and return because they can’t afford what they buy. They are “faux buying.” I see this a lot as I work in retail. I see the same people over and over buying armfuls of clothes that get returned within a week or two. Information you may not want to know: It’s a tad irksome for the retailer to take back returned items because the returns “count against” daily, weekly, and monthly sales goals. I know, I know! No shopper thinks about — or is even aware — that such goals might exist. But here’s some additional news you can use. All too often, returned clothes have been worn or damaged in some way, so they are taken out of inventory and are a loss, impacting the bottom line. Or the clothes are returned out of season (for stores with a generous return policy) and also are a loss. Then there’s the cost of restocking the returned items, etc. So there is a hidden cost to those returns that we all pay for in the form of higher costs — or worse — the same cost but lower quality clothing. BUT I urge people all the time to return clothes that fall apart at the seams after one wear or shrink to Barbie size after a careful wash or two. Don’t through these clothes away. Take them back to the retailer (mail them back with a firm note) and ask to speak to a manager. How else is the retailer to know their stuff is shoddy? OK, I am stepping down from my soap box. I hope everyone has a lovely day! You made some very good points here, Dottie. The point about the money adding up makes me think of the “Starbuck’s analogy” that is often used by those in financial circles. People who spend 3 or 4 dollars on a latte every day don’t really stop to think about those expenditures and how they can really impact the bott0m line. I think it’s good for all of us to become more conscious of what we’re spending whether or not we are in debt. You’re right that if we choose to spend in one area, we’re often deciding (either consciously or not) NOT to spend in another area. It’s good to think more deeply about these things so we can be sure our spending is in line with our true priorities. I think it’s really all about balance and that will look different depending upon the individual. We all have to decide what that means for us, and it will likely change over the course of our lifetimes. In regards to returns, there are many factors to consider there, too, and you mentioned many of them. But one factor I never used to consider was my time. I spend an inordinate amount of time making returns and I didn’t realize how that was impacting me until last summer when I overbought at the Nordstrom Anniversary Sale and spend a lot of time and energy on returning things, buying other things, etc. I finally GOT how much time I was wasting and how I could have put the time to better use. Your points are very valid, but I wanted to add this one to the mix, too, because it wasn’t really top of mind when I wrote the original post on serial returns. This is hard to admit, but after reading Dottie’s comments, I feel I must respond “from the other side”. I’m aware I’m opening myself up to a lot of negative responses in doing so. I have been a serial shopper, much more in the past than now–although truth be told, I go through a bout of serial shopping at the start of spring and fall each year, the reasons for which I will explain further along. But–in the past, I used to serial shop year round as recreation. My reasons now are somewhat different. Years ago, I serial shopped then because I was trying to either escape from myself or discover who I was through clothing. In the beginning, I was single, parenting a special ed child and shopping was the only relaxation I could find to take me out of the difficulties of my daily life. Later on, I became involved in a problematic romantic relationship, and I serial shopped as a means of figuring myself out and/or making myself feel better through style. I have gotten past all that. Now I serial shop twice a year. In fact, this past week is my typical time to serial shop for spring/summer. The seasonal palettes are out at my favorite retailers and I start figuring out what I might want to add to my existing wardrobe. The stores are having sales, and the pieces I want are available in my size. At the same time, I am purging items from the year before because they don’t look or feel good as my tastes evolve, and I want to add some new things. I tend to maintain the same overall number of clothing pieces from one season to the next but there is a turnover. I keep track. Because I take very good care of my clothes, 90% of the turnover goes to consignment. Like Debbie, I have a monthly clothing budget (mine is less than 200./month) and I don’t have a problem sticking to it because I wait to buy until things are on sale. The only time I will purchase at full retail is if it is a special rare opportunity to acquire, but this seldom happens. My reasons for serial shopping now are much different now. I am not trying to escape anymore. Now its totally about the logistics. I work full time in a management position with my company, and three years ago my father passed, leaving me to care for my 85 year old mother who is severely handicapped and requires 24/7 attention. We have aides who work in the home during the day, but a lot of my time outside of my job is devoted to attending to my mother’s needs in the evenings seven days a week. Shopping is a luxury I sandwich in my busy schedule very strategically. I may only have a 90 minute window during which I can carve out a shopping trip in the course of a day. Most of the retailers I shop at are located 20-30 minutes from my home. Factoring in an hour round trip commute, that gives me about 30 minutes to actually shop. To make the most of my time, I will know in advance what garments I am interested in, but am open to looking at others if I can be efficient about it. If I am searching for an item in a particular color, such as last week I was looking for a coral top–I will purchase several different styles in that color to take home and see how they coordinate with the pieces I already have. Sometimes if a retailer has changed their sizing, (which happened this season at Loft, one of my favorite stores), I purchase in two sizes to determine correct fit. Because I can’t carry my wardrobe with me to coordinate style and color with other pieces, this system works for me, and I am honest with the sales person up front as to what I am doing and that I will be returning some of the items. I would like to add that I prefer this system because usually the lighting in the dressing room is so off kilter that I find it impossible to accurately coordinate new clothing with what I already own unless I have the pieces in front of me to compare. My preference is to shop in a brick and mortar setting if possible (where I can experience the clothing) because I find that ordering online, while convenient and tempting–is often disappointing, and results in more returns due to fit or color. So Dottie, you might find me to be an annoying customer were I to shop in your establishment, and I respect that I am probably viewed as a pain. But I am a loyal customer to the stores I shop at. The circumstances of my lifestyle do not allow me to spend leisurely hours strolling through mall stores, experimenting with the perfect garment so I never have to return it. I go in purposefully with a list of options and an open mind about what I might like to add to my wardrobe, purchase and take them home, see how they work and return them within a few days if they don’t. Sometimes its not about playing games with money. Its about how much time you have allocated to shop for the season and how you strategically plan your free moments. 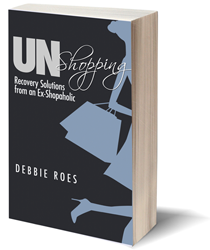 Deborah (Debbie): I NEVER said that serial shoppers are “annoying customers”!!! I was trying to make the point (badly, I guess) that there is a hidden cost to serial returns which we all pay for, generally in the form of slightly lower quality of clothes. I often ENCOURAGE a lot of customers to buy a few things and then them home to decide on which one they (or their family) likes best. Or which dress goes with a pair of shoes or works as a mother-of-the-groom dress, and so on. I OFTEN tell customers to take clothing home and try it on with the rest of their clothes. And then there’s the folks who are disappointed with their on-line purchase and return it. And there are people who return the “almost perfect” item because they found the perfect item somewhere else. And so on. And the kind of shopping you describe fits into these categories. I don’t call that serial returning. The serial returning I was referring to what Debbie blogged about (link above) a while back — buying a lot and returning a lot so you can buy more. Generally, serial shoppers are great customers because they do buy a lot of clothing and they love fashion. It’s so much more fun to help people who love fashion than people (like me) who run in to buy s simple white tee on sale. I spend a lot of time (because I like to) helping customers find the right item. Personally, I don’t care if someone returns the item — it’s just a transaction after all. My relationship with customers is not driven by sales goals or commissions — I want to help each customer find the right clothing so s/he will look there best. There are a lot of customers who remember how I helped them find the right ________ (fill in the blank). And every return is an opportunity to help someone find the right item! Although I work in retail, I seldom shop. I too have a very busy life (3 jobs and heavy volunteer commitments). I work from an annual shopping list and budget and maybe go to a store to make a purchase 4-5 times a year, maybe less. I don’t stroll leisurely through the store. I know what I am going to purchase (based on on-line research) and I walk in, go to the appropriate area, make the purchase, and leave. Having taken care of an elderly parent, I understand the many pressures you face. It’s one of toughest jobs in the world — and one of the most rewarding. I apologize for misunderstanding you! I guess I wasn’t reading as carefully as I should have. One more thing I meant to add, which probably contributed to my perception of your comments, Dottie–is that before now I never truly realized that people buy things for the express purpose of returning them so they can buy more stuff? That is something I’ve never done, and I don’t really understand the motivation to do so. In the past I shopped for amusement and variety, but now I go shopping for the purpose of finding something I like on my list. Yes, I may have to try several different iterations to get it right for me, and I thought THAT’s what was meant by serial shopping–the inability to make up one’s mind about a garment while in the store–and buying multiple versions, then returning all but one. Just wanted to clarify that I never actually bought things for the express purpose of returning them to buy more stuff. I’m sure some people do that, though. However, I would sometimes RETURN things that I hadn’t worn yet because I thought I might like new things more than those items. A big part of that motivation was to shop more, but I also thought that I hadn’t made the best decision in buying those things in the first place. I would often get so caught up in the moment when shopping that I didn’t take the time to carefully consider what I was buying. Of course, I still make shopping mistakes and I outline them here, but fortunately my track record has improved considerably. Like you, Deby, I do much less shopping for amusement and variety and mostly only go shopping to find things on my list these days. I can’t imagine how you would get criticism for the shopping process you outlined, Deby. It makes perfect sense and seems to be the best possible solution for your life situation. It also sounds very well thought out and analytical. I actually want to move more toward shopping like you do with a seasonal focus instead of continually buying. I have more free time than you do, so I usually spend more time in the stores, but I’m starting to think it’s better to try things on at home, too, because of lighting issues and to have access to the rest of our wardrobes to coordinate with new items. I have been doing more online ordering as of late because I have been looking for specific and somewhat elusive items, but such shopping (for me) inevitably leads to more returns and can be quite frustrating. I think you are wise to select a few retailers that work well for you, do some pre-shopping (browsing) online, and then do exactly what you’ve been doing. The fact that you explain to the salespeople what you’re doing is great and I’m sure it’s also appreciated. As Dottie mentioned, the type of serial returns I frequently did were quite different. I think I had such an emotional need to shop that I would do whatever I could to shop as much as possible, including returning unworn items to buy more. I am fortunately moving away from such needs, but old habits still die hard. I still return more than I want to, but lately it’s been more because I realized that I didn’t really need the item or it didn’t work well with my existing wardrobe. Sometimes it also has to do with not trusting myself enough to make the right decision, too. If I’m at all uncertain about an item now, I try not to buy it. But if I do buy something and later question it, I find it’s better to just return it than end up with a potential “dud.” I’m still learning, as we all are. Some of us learn more quickly than others. It sounds like you’re doing great, Deby. You have made tremendous progress with your wardrobe and shopping since you first started commenting on this blog. I commend you!